There are many approaches to treatment for substance abuse with each having a personal aspect to overcoming problematic effects, consequences, and behaviors. Combined with counseling and services to address multiple goals and needs, support group therapies in substance abuse treatment programs offer a wide range of possibilities to augment treatment success. The most commonly recognized group therapy models are psycho-educational, skills development, cognitive behavioral/problem-solving, interpersonal processes, and support groups such as 12-step, mutual aid, faith, or family groups. Together, these groups empower people in their abilities to make positive choices for the decisions that affect their lives by advocating experiential knowledge of addictions, shared concepts and feedback, education, materials, resources, and guidance to the members. Many of the compulsions to use drugs and engage in the associated behaviors are mastered through learned experiences and habitual developments that allow the person to continue using substances while others evolve from chemical disruptions that change the way the brain operates. Motivating changes and achieving positive goals is a part of recovery that requires ongoing support after detox and stabilization is accomplished in the clinical sense. According to the SAMHSA, “The client’s stage of change will dictate which group models and methods are appropriate at a particular time.” These stages range from pre-contemplation or not thinking about changing to; preparing to or taking action to change, maintaining abstinence, or recurrence (relapse or the return to an earlier stage).” It can take a while to get back momentum and confidence, but, with abstinence and supportive therapies, the person can “readapt” in their capabilities to enjoy life without the use of substances. 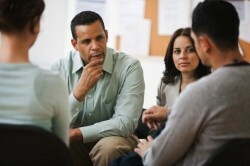 What Happens in Support Group Therapies? Recovering addicts learn coping strategies to avoid relapse while attending support group therapy. Psycho-educational groups, combined with skills development and cognitive behavioral groups, help individuals learn to identify, avoid, and master internal and external influences that are common triggers to cravings, and relapse. The basic ideas of cognitive-behavioral groups are to help individuals see how situations, thoughts, emotions, physical feelings, and behaviors interact to lead to relative risks of and protections from impulsive substance abuse. Other useful agendas are learning strategies to avoid people, places, and things that could lead to relapse and stress management techniques to cope with negative circumstances through meditation, exercise, relaxation, nutrition, and spiritual development. Bolstering the efforts of each member, support groups strengthen the ability to manage negative thoughts and emotions while sorting out problematic behaviors and learning to manage living soberly on a day-to-day basis. As members build or rebuild reliable sources of encouragement and witness the recovery of others, hope for their own recovery can be restored and continuously maintained through participation in support groups such as Alcoholics Anonymous or Narcotics Anonymous. Relapse prevention is a primary goal for support group members, but, relapse is a likely event which makes the support and non-judgmental acceptance from others struggling to recover all the more powerful.